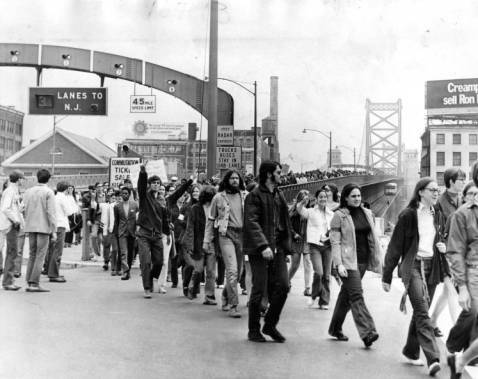 These organized protesters marched across the Benjamin Franklin Bridge from their New jersey schools and residences to protest the war in Vietnam. 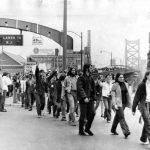 This march on May 8, 1970, like many others, led them to Independence Mall, a well-known and symbolic location for protest rallies in Center City Philadelphia, located only blocks from the bridge. The march occurred four days after the Kent State shootings, in which twenty-eight national guardsman opened fire on a crowd of protesting students, killing four and wounding nine. 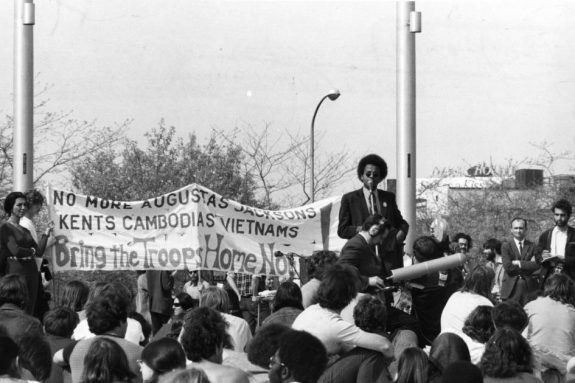 the protests became both against the United States’ involvement in the Vietnam War as well as its lack of respect for protesters and the public discourse for the war; it also led to large-scale protests on college campuses nationwide. This photograph appeared in the Philadelphia Evening Bulletin in early May 1970, just after President Richard Nixon’s announcement of the invasion of Cambodia and decision to draft 150,000 more American soldiers. (American casualties were documented at about six thousand in 1970, or roughly five hundred per month, according to the National Archives). 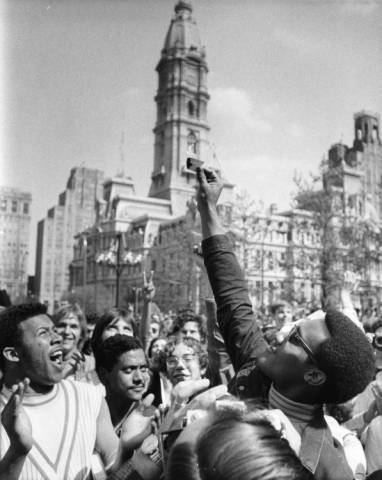 Gene Young, a student government leader from Jackson State College in Jackson, Mississippi, addresses protesters at Independence Hall, memorializing the lives lost at Jackson State a year earlier, in May 1970. These protesters gathered to oppose the violence both abroad and domestically. While many Americans opposed the war, the sign's message of “NO MORE AUGUSTAS, JACKSONS, KENTS, CAMBODIAS, VIETNAMS” underscores the protest's dual targets, U.S. military involvement abroad and the violence at home against protesters. The American opposition to the war in Vietnam escalated after President Richard Nixon’s decision to invade Cambodia and expand the draft in April 1970. After protests intensified and students set fire to the ROTC building at Kent State University, nine hundred National Guardsmen were deployed to the campus to control the crowds and uphold the peace. When four students were killed and nine wounded by National Guardsmen at Kent State on May 4, 1970, and two students killed and nine wounded by state police at all-black Jackson State College ten days later, national unrest grew. 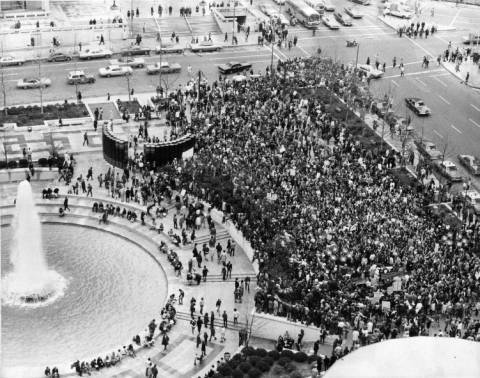 Here, hundreds of protesters fill John F. Kennedy Plaza on the afternoon of April 16, 1970, one of many rallies in the city from the early 1960s until the end of the U.S. involvement in Vietnam in 1975. Over time, rallies of the period became well-organized and reached large sizes during the later war years. Protests like this one were well-publicized and well-covered by the media. This photograph appeared in the Evening Bulletin. 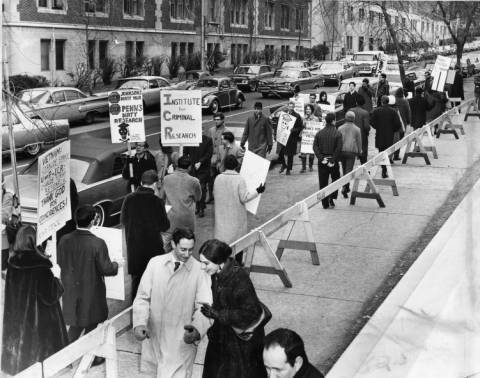 In this march in front of Irvine Auditorium in January 1966, students, faculty, and others protest the University of Pennsylvania’s biological and chemical warfare research. Among the protesters' signs are those reading “Stop Penn's Dirty Research" and "Institute for Criminal Research." 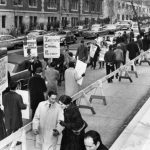 For a time the university defended itself by saying the research was "defensive research," but eventually, the university's Board of Trustees overwhelmingly decided to cancel the school's chemical and biological warfare contracts. 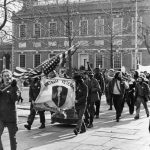 Young Philadelphians were drawn into the Vietnam War as American involvement escalated. Frank Marshall, a native of Tioga in North Philadelphia, recalled how his cousin and neighbors became involved. “There was a couple that went into the Marines,” Marshall recalled in his oral history. (See Links section.) “They wanted to go into the Marines before they got drafted, and then a lot of them got drafted but most of the crowd I went with, very few got drafted. 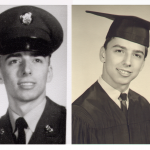 Deferments, college—a lot of them went to college, so they didn't have to go into the military at that time.” By 1969, Marshall’s cousin, Charles "Chicky" Gibelterra had been killed, and he himself would be drafted into the U.S. Army, eventually serving in the 101st Airborne. For some draft-age men, publicly burning a government-issued draft card was one of the most expressive ways to show opposition to the mandatory lottery drafting system. Men could obtain a “conscientious objector” status on the basis of philosophy, disability, disposition, or religion, but gain such a deferment often required the help of a lawyer. 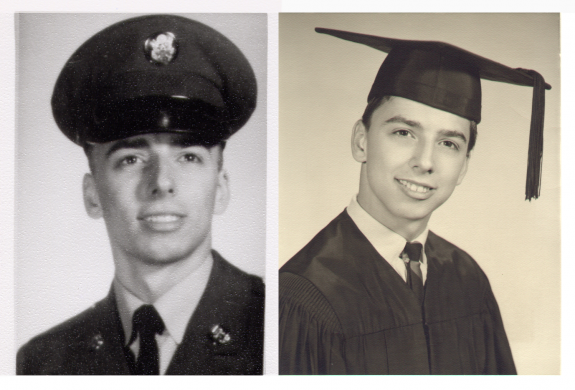 According to the National Archives, the most common casualty age for servicemen in Vietnam was twenty years old. Over time, some men who had served in Vietnam returned and organized to protest against the U.S. presence in Vietnam. 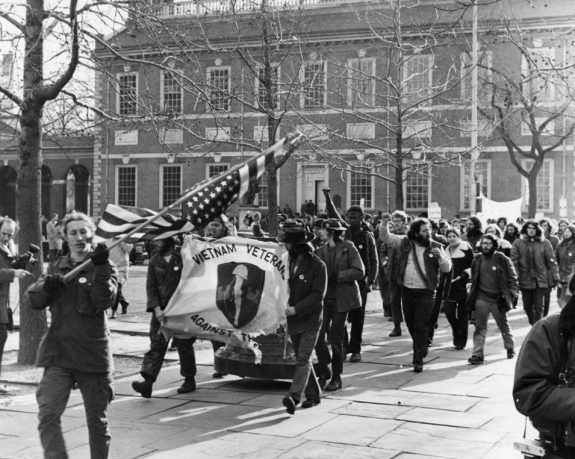 Here, the organization Vietnam Veterans Against the War marches near Independence Hall. The leader of this group holds an American flag that has been hung upside-down, a symbol of distress or danger. Many veterans returned from the war with injuries or post-traumatic stress disorder, and although veterans were given benefits for education through the G.I. Bill, the poor state of the U.S. economy and the region's decline industrial base meant that many veterans did not not have the same economic opportunities as previous generations of returning soldiers. Many Southeast Asian migrants resettled in the Philadelphia region after the war. 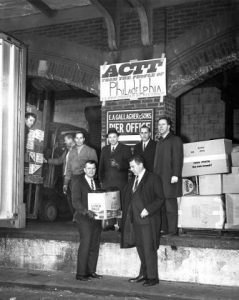 This immigration wave was fueled by a post-1965 American immigration policy that emphasized family reunification and encouraged chain migration, which made Philadelphia home to one of the largest Vietnamese communities in the United States. By the arrival of the twenty-first century, the Vietnamese were the largest foreign-born population in Philadelphia, numbering nearly twelve thousand. South Philadelphia and Elmwood, neighborhoods previously housing many European immigrants, became common residences for the new refugees. Some Vietnamese immigrants benefited from being able to speak Chinese, and Chinatown saw a business uptick owing to the new arrivals. By 2015, the combined Philadelphia-Camden-Wilmington region had a population of 34,507 Vietnamese, including nearby towns like Pennsauken, Egg Harbor, and Atlantic City. Camden County had become home to 4,260 Vietnamese, the largest number in any county of New Jersey. 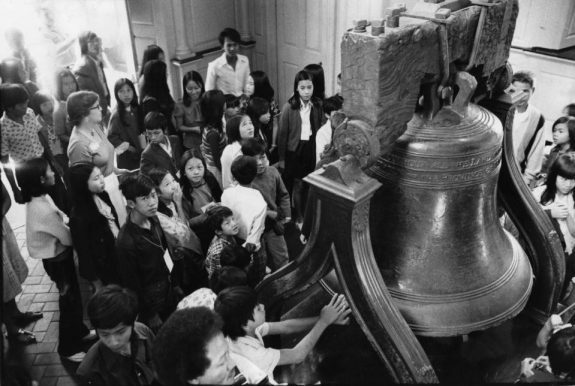 In this photograph, a group of Vietnamese gathers around the Liberty Bell to learn about its place in U.S. history. One man holds a box of what appears to be clothing, while other boxes contain canned goods. 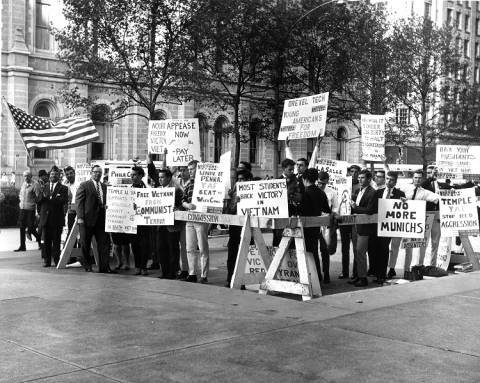 While many Americans openly protested the war in Vietnam, many also held counter-protest rallies to show support for the Republic of Vietnam’s forces against the communist-influenced North Vietnamese forces. Americans were motivated by both patriotism and fear of communism in supporting the coalition of American and South Vietnamese forces. 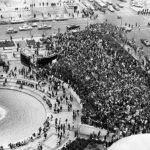 Polls indicated mixed public feelings about the U.S. involvement, but by 1967 large demonstrations, teach-ins, petitions, and civil disobedience spread beyond pacifist groups to college campuses and the public nationwide. The Vietnam Veterans Memorial at Penn’s Landing became the largest tribute to Philadelphia’s war dead, with the etched names of about 650 soldiers who died during the war. Located at Spruce Street and Columbus Boulevard, a portion of the memorial is an amphitheater with walls of polished granite from Minnesota. 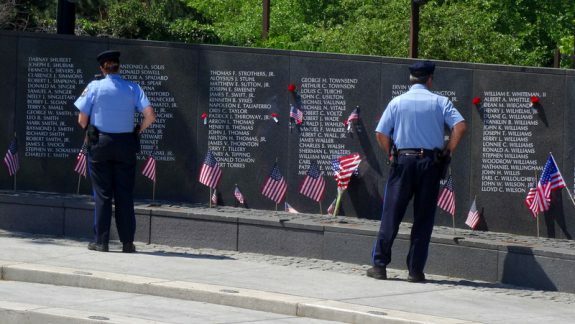 Here, two Philadelphia police officers peruse the names on May 25, 2015, in observance of Memorial Day. The Vietnam War, like the Great War, World War II, and Korean War before it, had a significant impact on the Philadelphia region. During the height of open American involvement in the war from 1965 to 1968, thousands from the area were drafted or volunteered for the armed forces, and hundreds lost their lives. Other citizens participated in antiwar or peace protests. While the war created employment in defense industries, it limited economic opportunity in other ways, especially in the postwar period. Among the most lasting of the war’s impacts, the region gained a more diverse population from an influx of political and economic migrants from war-torn countries in Southeast Asia. In the early 1960s, few people were fully informed about the events that had transpired in Vietnam since the end of World War II. The United States had been involved in the region for decades, initially supporting France with billions of dollars of aid against anticolonial Vietnamese nationals. After the departure of the French in the mid-1950s, the United States remained in the region and supported anti-communist forces there as part of the larger Cold War against the Soviet Union, lending support to the Republic of Vietnam (South Vietnam) while opposing the Democratic Republic of Vietnam (North Vietnam). Young men from Pennsylvania, New Jersey, and Delaware became drawn into the Vietnam War in large numbers between 1962 and 1968 as American troop levels in South Vietnam escalated from 10,000 to nearly 550,000, the vast majority added after the 1964 Gulf of Tonkin incident. By the end of the war in 1975, when the North Vietnamese captured Saigon and the United States withdrew its last contingent of regular military forces, more than 3,100 Pennsylvanians had been killed as a result of the conflict. Of these, 646 (20 percent of all the Keystone State’s war dead) came from the city of Philadelphia alone. Philadelphia’s Edison High School lost sixty-six alumni, more than any other high school in the United States. The city of Camden and Camden County accounted for nearly 6 percent of New Jersey’s nearly 1,500 killed, while Wilmington and New Castle County accounted for 68 percent of 122 men from Delaware who perished. The enormous manpower needs and the increased “credibility gap” between the federal government’s rationale for the war versus the realities conveyed through television and soldiers’ accounts led to the development of what one scholar has called the “largest and most effective antiwar movement in American history.” While not limited to college students, anti-war activism in the Philadelphia region drew strength from increased enrollments on many of the region’s campuses, due in part to the awarding of educational deferments for the draft. In 1966, students and faculty at the Quaker-founded colleges of Haverford, Bryn Mawr, and Swarthmore Colleges went on an extended hunger strike to protest American involvement in the conflict, an action eventually joined by students at Friends Select High School. By 1967, mass demonstrations, teach-ins, petitions, and civil disobedience spread beyond locations and groups traditionally associated with pacifism, extending to Temple University, the University of Pennsylvania, and other campuses. As a result of nearly two years of campus protests and debates, Penn’s Board of Trustees overwhelmingly decided to cancel its chemical and biological warfare contracts with the Pentagon. As in other metropolitan areas across the country, most people were not directly involved in fighting the war, but they experienced its impact and divisiveness nonetheless. 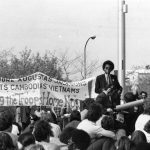 Debates about the Vietnam War and American involvement took many forms on college campuses, at federal facilities, and in public spaces. Philadelphians demonstrated in support of the war as well as against it. The Liberty Bell and Independence Hall, symbols of American democracy, became contested sites for demonstrations by those who supported the war as a crucial element of the Cold War against Communism as well as those who believed the war immoral or simply a waste of taxpayer money. In this heated political climate, acts of open defiance toward the American government occurred, such as the “Camden 28” raid of one of the city’s draft boards and the theft of classified documents from an FBI office in Media, Pennsylvania. When young men were drafted or enlisted, their absence from the workforce opened opportunities for others. 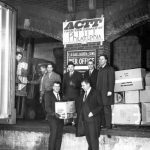 Philadelphians benefited by working in defense industries such as local shipyards, arsenals, and private companies that supplied material and weapons to the military. 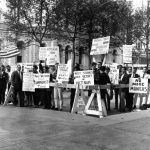 In 1968, economists estimated that without the Vietnam War, local employment in federal government agencies related to the war effort would have dropped 10.2 percent, amounting to thousands of people, and total federal expenditures in the Philadelphia region would have dropped 42.3 percent, amounting to nearly $2.5 billion. After the war, the region and the nation as a whole experienced starkly negative economic impacts. Because the Vietnam War and the Great Society domestic programs of President Lyndon B. Johnson (1908-73) had been financed simultaneously without any significant increases in taxes, the ensuing effects of runaway double-digit inflation and mounting federal debt ravaged the economy. Although veterans had opportunities for education through the G.I. Bill, the poor state of the American economy compounded with declining industry in the region meant that many would not have the same economic opportunities as previous generations of veterans. In addition to the challenges of a deindustrializing economy, the smooth reintegration of Vietnam veterans was further complicated by postwar health and addiction issues. These included the debilitating effects of exposure to the toxic herbicide “Agent Orange” (the Veterans Administration presumes that anyone who served in Vietnam between January 9, 1962, and May 7, 1975, was exposed and therefore eligible for benefits), drug abuse, homelessness, and post-traumatic stress disorder. America’s longest war in the twentieth century also led to one of the most dramatic and visible demographic changes in the region’s history. 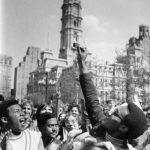 Although not always welcomed—a study by the Philadelphia Commission on Human Relations revealed that the new arrivals were disproportionately victims of interracial violence in the late 1980s—a surge in refugees in the aftermath of the Vietnam War led significant numbers of Southeast Asian migrants to resettle in the region. This influx, combined with post-1965 American immigration policy that emphasized family reunification and encouraged chain migration, made Philadelphia home to one of the largest Vietnamese communities and the second-largest Cambodian community in the United States. By the arrival of the twenty-first century, the Vietnamese were the largest foreign-born population in Philadelphia, numbering nearly 12,000. South Philadelphia and Elmwood, neighborhoods known for migrants from European countries in previous times, became spaces where these newcomers resided and congregated. Vietnamese refugees, especially those who could speak Chinese, initially frequented Chinatown and proved a boon to shop owners there, but by the twenty-first century they had carved out a neighborhood that became colloquially known as “Little Saigon” in South Philadelphia. By 2015, the combined Philadelphia-Camden-Wilmington Metropolitan Statistical Area had a population of 34,507 Vietnamese, with the outskirts of the city of Philadelphia and nearby towns like Pennsauken, Egg Harbor, and Atlantic City home to their highest concentrations; Camden County had become home to 4,260 Vietnamese, the largest number in any county of New Jersey. The influx of these new Americans from Vietnam, Cambodia, and Laos introduced a polyglot of cultures, foodways, and traditions into the already diverse region, reinvigorating the region just as previous generations of immigrants before them. For decades afterward, the impact of the Vietnam War could be seen, and remembered, across the region. 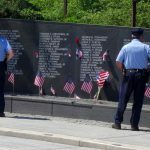 Penn’s Landing became home to the largest memorial for Philadelphia’s war dead, but equally poignant plaques and spaces honored individuals who served and perished. The statewide New Jersey Vietnam Veterans’ Memorial was erected in Holmdel, New Jersey, for the same purposes. Veterans Memorial Park in downtown Dover, Delaware, added several Vietnam memorials in addition to those for servicemen lost in other conflicts. Edison High School built a memorial to its alumni, just as many other smaller organizations did after direct American military involvement ceased. 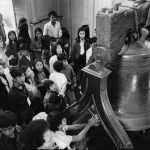 Nearly a half century after the end of the Vietnam War, the legacy of the conflict could also be seen in the faces of the Southeast Asian migrants and their children who made the city of Philadelphia and its environs their home. Nicholas Trajano Molnar is Assistant Professor of History at the Community College of Philadelphia and author of American Mestizos, the Philippines, and the Malleability of Race, 1898-1961 (University of Missouri Press, 2017). Previously, he served as Assistant Director of the Rutgers Oral History Archives. Trajano Molnar serves as the Digital Humanities Officer of the Immigration and Ethnic History Society and coordinates the “Philly Stories” Student Oral History Archive. Chatfield, Charles, “Peace and Antiwar Movements;” Sitkoff, Harvard, “Vietnam War (1960-1975): Postwar Impact”; and Small, Melvin, “Vietnam War (1960-1975): Domestic Course” in Chambers II, John Whiteclay, editor-in-chief. The Oxford Companion to American Military History. New York: Oxford University Press, 1999. Goldstein, Jonathan. “Vietnam Research on Campus: The Summit/Spicerack Controversy at the University of Pennsylvania, 1965-67.” Peace & Change, Vol. 11, Issue 2 (July 1986): 27-49. Isard, Walter and Thomas W. Langford. “Impact of Vietnam War Expenditures on the Philadelphia Economy: Some Initial Experiments with the Inverse of the Philadelphia Input-Output Table.” Papers in Regional Science, Vo1. 23, Issue 1 (January 1969): 217-253. Pamela Cooper, “Vietnam War;” and Katherine Jones, “Vietnam Veterans’ Memorial and Vietnam Era Educational Center,” in Lurie, Maxine and Mark Mappen, editors. Encyclopedia of New Jersey. New Brunswick, N.J.: Rutgers University Press, 2004. Lyons, Paul. The People of This Generation: The Rise and Fall of the New Left in Philadelphia Philadelphia: University of Pennsylvania Press, 2013. Millett, Allan Reed, Peter Maslowski, William B. Feis. For the Common Defense: A Military History of the United States from 1607 to 2012. New York: Free Press, 2012. Takenaka, Ayumi, and Mary Johnson Osirim, editors. Global Philadelphia: Immigrant Communities Old and New. Philadelphia: Temple University Press, 2010. Imaginative Representations of the Vietnam War, LaSalle University, Connelly Library, 1900 W. Olney Avenue, Philadelphia. Urban Archives, Special Collections Research Center, Paley Library, Temple University, 1210 Polett Walk, Philadelphia. Statistical Information about Fatal Casualties of the Vietnam War, National Archives and Records Administration, 8601 Adelphi Road, College Park, Md. Philadelphia Vietnam Veterans Memorial, Columbus Boulevard and Spruce Street, Philadelphia. New Jersey Vietnam Veterans’ Memorial, 1 Memorial Lane, Holmdel, N.J.
Edison High School Memorial, 151 West Luzerne Street, Philadelphia.